Product Description: Buy sell or trade vintage and used automobiles with confidence! The 2010 Collector Car Price Guide gives you over 250,000 values for 146 car and truck makers from 1899 to 2002. It\'s compact, comprehensive and uses the trusted Old Cars Weekly 1-6 vehicle rating scale to provide accurate, up-to-the minute values. Product Description: Documents the appealing, high-performance AMC cars. Starting with the 1951 Nash-Healey, then the Hudson Hornet, Nash Ambassador "Le Mans", the awesome 1957 Rambler Rebel, the 1966-1969 Rambler American Rogue, the Rebel Machine, AMX, 1969 Scrambler, 1971 Hornet SC360, 1972-1975 V8 Gremlin, Javelin, and others. Product Description: A collection of 41 articles starting with the resurrection of the Rambler name in 1956 through to the 1970 model. The story follows the introduction and development of the Marlin, Ambassador, Six, Rebel, Rambler, Classic, American, The Machine, Rogue and Hurst SC/Rambler. It then continues with the re-named Rambler/AMC cars - Marlin, Ambassador and Rebel series. Product Description: Volume 3 from PowerBlockTV's award winning MuscleCar series, this 1 hour and 18 minute DVD is packed with history, production facts, specifications, power & torque stats, interviews and driving action on 23 different muscle cars that ruled the streets and tracks in the 60's and 70's. 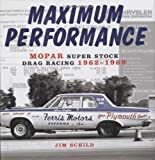 Product Description: Colorful package distills the essence of the 27 most influential muscle cars from the 1960s and 70s.